Acadian Genealogy Homepage; Jim Gaboury's Review of CD-ROM! Following is an "independent" (and unsolicited) review/evaluation relative the "In Search of Our Acadian Roots" CD-ROM Project. If you, or someone you know, has published similar "reviews/evaluations" on the Acadian CD, I would greatly appreciate receiving a copy, which I will be pleased to post on this Page. The following is a "review" by Jim Gaboury, published in the Spring 1997 (Volume 11, No. 3) "Quarterly" newsletter of the French Canada/Acadian Genealogists of Wisconsin. The "In Search of Our Acadian Roots CD-ROM" is a disk full of many useful programs. You will also find Acadian and French Canadian genealogical [on over a Half Million Acadian/French Canadian Names] and historical information. Best of all, it may help you get in contact with people who are researching your Acadian family names or even your French-Canadian family names. 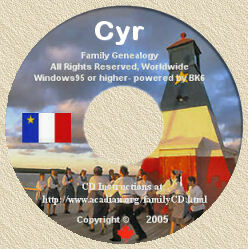 The CD has 519,008 mostly Acadian and French Canadian names on it. There were 135 participants in this worthy project. "a-read.1st" from the 'root' directory of the CD. There is also a copy of this file in the 'text' directory. "software.doc" from the 'infodoc' directory of the CD. "gensrch.doc" from the 'software' directory of the CD. "fileinfo.doc" from the 'infodoc' directory of the CD. "badgeds.doc" from the 'fileinfo' directory of the CD. It also can be found in the 'root' directory. This ".doc" printout explains why a few of the gedcoms on the CD, are placed in the "bad-geds" directory and how you can still make use of them. "aa-index.txt" from the 'software' directory of the CD, is a list of the compressed/zipped Shareware/Freeware files on the CD. There are approximately 22 MB worth of these programs, in over 225 files. Most of these are "Personal Ancestral File" utilities. There are some utilities for the "Brother's Keeper" program as well as 20 or so gedcom utility programs. One of these utility programs is a gedcom file editor, another is one that analyzes and repairs gedcom files, and another sorts the data in a gedcom file, just to name a few. If you do purchase this CD, a careful reading of the "a-read.1st" file is advised, especially the part pertaining to how to run the "acadian.exe" program. The software program that accesses the information on the Acadian CD is called "acadian.exe". Since the data files on the CD are not encrypted the information can be extracted and copied to your hard drive, even if you have a Mac computer. The search and seek part of the "acadian.exe" program, however, does not work on a Mac. When you select the "N" option at the menu screen after the "acadian.exe" program has been properly started, it will compare your own gedcom file to the gedcom files on the CD. It then takes all of the matches between the names in your gedcom file and the names in the gedcom files on the CD, along with the data in the gedcom file and creates a file called, "results.mat". This file is then displayed by the DOS "EDIT" program showing you all of the matches and the names of the gedcom files from the CD that match the names in your own gedcom file. You can then check the "fileinfo.doc" printout or the "gedcoms" directory for the gedcom name and the name and address of the person who submitted it. Voila! You may have found one or more Acadian or French-Canadian cousin(s). Now before I go any further, I suppose I should explain what a "gedcom file" is. A gedcom file is a file that is created by most, if not all, genealogy software programs nowadays. They will have that option as one of their features. It was developed mainly because there was a need for a program that would enable people who use different genealogy programs to be able to import each others genealogical data into their own, if they so choose. Because of this feature a person doesn't have to do a lot of typing to enter another person's genealogical information into their genealogy database just because his/her genealogy program isn't compatible with someone else's. One of the more useful programs on the CD is "gensrch.zip". When it is unzipped into its own directory on a hard drive, a set of worthwhile programs results. The main program "gensrch.exe" (a search-seek program) is a command line UNIX style program that goes beyond "acadian.exe" in that where "acadian.exe" allows a person to find matches between their gedcom files and those on the CD, "gensrch.exe" allows a person to not only match those on the CD but also lets them find matches between their gedcom(s) and those given to them by others. The program. "ged2srch.exe" scans a gedcom file, and generates one line of information about each person in it. Another program is called "soundex.exe". This is a program where you type a surname and it will give a soundex code for that name. A fourth program "surnames.exe", generates a surname list from gedcom files giving the number of times in the gedcom file the surname is found and the name of the gedcom file(s) in which it is located. There are other programs in this set including two (2) short 'demo' files that can be accessed by the "gensrch.exe" program so that you can get a feel for using the gensrch program. Then there is "combsrch.exe" which printout the result of a gensrch report by combining the matches of the various gedcom files in that report. The four remaining programs are best left to be read about in the "gensrch.doc" print out. In the Tafels directory on the CD, you will find a TT (tiny tafel) report on each person who has contributed a gedcom on the CD. In the "text" directory on the CD, you will find a lot of very useful information, but you will have to look for it. As a help I will list some of the more interesting types of information and where to look for it. In the "j-croche" subdirectory you will find censuses for several Acadia and Louisiana locations between the years 1671 and 1777 as well as some military censuses for 1770 and 1777. There is a list of Acadians in the Revolutionary War (1766). You will also find "Acadian Place Names" giving former and current names for each place. There is a list of Acadian surnames of those expelled from Nova Scotia between 1755 and 1764. Another file has the names of Acadians' exiled to South Carolina and the ships they were on. There are other text files in this directory, but these are some of the more important ones. In the "misc" subdirectory of the "text" directory you will find a list of addresses, hours and phone numbers of the various Canadian Archive sites (can-arch.txt), a short list of books useful for researching Canadian genealogy (can-book.txt), a list of genealogical societies in Canada (can-gens.txt), tips for searching Canadian military records (can-mil.txt), a list of Canadian resources (can-rsce.txt) such as libraries, archives, churches, and societies along with a brief list of what is available at most of those places, a list of Canadian provinces with the addresses, phone numbers, and fees of Vital Statistic offices in each Province (can-vitl.txt), and an explanation of and a how-to do a "Tiny Tafels" report (tt-tms.txt). In the "p-berlo" subdirectory you will find four subdirectories, "acadhist", "acadiana", "reunions" and "tidbits". The "acadhist" directory contains interesting text files. One of these is a history of the Acadian flag. Another is a history of Acadia that includes an account of the great dispersion, "Le Grand Derangement". There also is a file that has the passenger list of the ship St. Jehan which left France on 1 April 1636 for Acadia. One other file has a list of the original inhabitants of Quebec City. There is more but I think this is enough to whet your appetite. In the "acadiana" subdirectory are files with a list of Acadian names and places along with the location of each. The "reunions" subdirectory has ten text files that are an alphabetical list of Surnames Associations and their addresses. It also gives planned reunion dates but the dates are mostly 1994. To find out any future planned reunion dates one would have to contact the particular association to find out when it is. The "tidbits" subdirectory contains 78 text files covering such things as Champlain's for the "Order of Good Times", a very brief history of Ellis Island, one that answers the question, 'What is a Cajun', some Cajun poetry, as brief explanation of the history behind the "Kings Daughters", and much, much more. In the "p-hall" subdirectory, two of the four files involve Urbain Baudrau dit Graveline. One is the descendancy chart and the other is his family group sheet. The "acadian.txt" is a list of responses to the statement, 'What it means to be an Acadian'. The "micmac.txt" file is an account of the close relationship between the Acadians and the Micmac Indians as well as a brief history of the Micmac Indians and their interaction with the Europeans beginning with the Vikings in about 1000 A.D. In the "t-ledoux" subdirectory is a set of text files starting with a 10 generation Ahnentafel Chart of a Thomas Joseph Ledoux. The second one gives the Ancestors of Charlemagne. The third (filleroi.txt) is a listing of the "Kings Daughters" and their marriage dates/places, and husband's names. It also includes interesting personal notes about some these women. Another useful file is the "frenchwd.txt" file. It gives the meanings of commonly used words, phrases and symbols used in French genealogical sources. The last text file (in English and French) is this subdirectory (vifran.txt) provides an alphabetical list of French Departments, their vital centers (bureaus of vital statistics), main National Archives, a listing of the Regions in France and the Departments within each, a list of the names of the old French Provinces and a chronological history of the French Departments. In the last subdirectory (y-cyr) in the "text" directory you will find quite a few text files dealing with Acadian history and its people, a text file with addresses of numerous genealogical societies/associations, two excellent files explaining "dit" names, a potentially useful bibliography for those doing Acadian genealogy research, a listing of addresses of Acadian archives, a listing of LDS Family History Center addresses in Canada, several short biographies of Cyr families, a listing of census and other records that are available from the "National Archives of France". Many other useful and interesting text files can also be found in this subdirectory. Judging from my experience, I am sure that people who do purchase this CD will not be disappointed with their purchase. They might be a little overwhelmed by the wealth of useful information and programs, but once they settle into knowing what they are looking for and start making use information pertinent to their research goals, they should be fine.
" In Search of..." Article by Hugo Larssen, which appeared in the July 15, 1998 issue of The/La Cataracte Newspaper. While writing this review, I received a copy of new instructions for the Acadian CD from Yvon Cyr, the originator of this project. The new instructions will be sent [as an e-mail attachment] to all the people who have previously ordered the CD. It will, of course, be included with all new purchases of the CD. Yvon Cyr in this revision of the instructions, has clarified things so that purchasers of this CD will have a very good idea of what each item on the "menu" screen that comes up after "acadian.exe" is run, is all about. It should also give them a better understanding of how to find information on the CD. The CD is a non-profit project produced by and available from Yvon Cyr for $49. (USA) or $69. (CAN.). Both prices include shipping and handling.